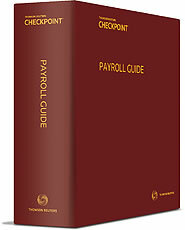 Payroll Guide is a comprehensive and easy-to-understand payroll reference and research tool that payroll professionals have relied on for more than 70 years, delivering the basic information and primary resources required to efficiently manage and administer a payroll. The Guide provides detailed explanation and analysis of federal, state, and local income tax withholding. Find answers to all your questions concerning deposit and reporting requirements, Social Security and Medicare taxes, federal unemployment tax, state unemployment and disability, benefits law and regulation, federal and state wage-hour laws, garnishments and child support withholding and much more. The Guide features a wealth of primary law directly linked to the text of the analysis to give you statutory backup whenever you need to make your point with management, unions and employees. You also receive, at no additional cost, the Payroll Guide Newsletter (biweekly) providing everything the payroll professional needs to keep up-to-date -- legislative developments, state regulatory updates, recent court decisions, current trends, commentary and advice from nationally known payroll experts. Employee Benefits: What Are Wages?